He's the star of bulletins chronicling Barack Obama's movements, one of only a few non-relatives to consistently get time with the Democratic candidate for president and a trusted confidant who has shared some of the most pivotal moments of Obama's career with him. Yet journalists who have followed Obama's campaign for the better part of two years don't know what he looks like, staffers who have logged countless hours traveling with Team Obama didn't even know he works for the campaign and there's never been a story in a major media outlet about him. He is Michael Signator, an aide and buddy of the man who - according to polls - stands a better-than-50-50 shot of becoming the next president of the United States of America. Technically, Signator's job is to provide "supplemental security support" for Obama's presidential campaign and also to coordinate the Obama family's personal and campaign schedules, according to Obama campaign spokesman Ben LaBolt. For security reasons, Obama's presidential campaign refuses to reveal the details of Signator's role, but LaBolt said it brings Signator into frequent, close contact with the Obamas. "Barack and Michelle Obama regularly confer with Mike, as do senior campaign officials. Sen. Obama has met with Signator both at the Obamas' home and at Mike's," LaBolt said in a statement. Though Signator owns a home in suburban DuPage County - about an hour west of the Obamas' Chicago home - he also rents an apartment on the 16th floor of a high-rise called Regents Park, located just a few blocks from Obama's house in the leafy Kenwood neighborhood on Chicago's South Side. When Obama is at home, he works out regularly in the well-appointed gym on the ground floor of the building. But according to so-called "protective pool reports" distributed among journalists following the campaign, Obama may also occasionally stop by the building just to hang out with "Sig," as some campaign staffers call him. On a Sunday morning in late June, for instance, a pool report explained that Obama "went for a workout at his friend's Mike Signator's building. He wore his black White Sox cap; a gray T-shirt and black workout pants. He only stayed about 15 minutes. Press staff was unsure whether he worked out or just hung with his friend." Pool reports have characterized Signator as, among other things, a "friend," a "longtime aide" and a "former bodyman." Bodymen are like traveling administrative assistants who cater to a politician's every need, from 2004 Democratic presidential nominee John Kerry's peanut butter and jelly sandwiches to Obama's MET-Rx chocolate roasted-peanut protein bars, which are kept on hand by his current bodyman, Reggie Love, a former football and basketball player at Duke University. Though the job can sometimes be less than glamorous, young up-and-comers leap at the chance to do it because bodymen, by definition, are the aides physically closest to - and trusted by - politicians, and that can lead to bonds akin to child-parent relationships with their bosses. Signator, though, is 50 years old - a few years older than Obama - and displays few of the trappings of a rising Beltway insider, with public records indicating he's spent most of his adult life in and around Chicago. Reached by telephone, he declined to comment on his relationship with Obama and his family, and asked how Politico obtained his telephone number. He directed inquiries to the Obama campaign press office and explained, "I can't do any type of interview at all. I apologize. I'm sorry, and please just disregard this phone number, because I can't take any calls." The campaign press staff; which at first denied that Signator worked for the campaign, then discouraged Politico from writing about him - declined to set up an interview. That leaves public records and the protective pool reports - written by journalists tapped from the traveling press contingent to follow Obama during all non-campaign-related activities and report back to their colleagues on the typically mundane details - to piece together a picture of Signator and his place in Obama World. According to Federal Election Commission records, Obama's campaign through the end of August had paid Signator $47,600. The payments, which began in March 2007 at $2,900 a month, dwindled to less than $800 a month in May of this year - a full year after the Secret Service began protecting Obama. Obama's 2004 U.S. Senate campaign paid nearly $50,000 to Signator, who had a cameo in Obama's 2006 book, "The Audacity of Hope: Thoughts on Reclaiming the American Dream." According to the book, Signator was the first person Obama informed after being invited to deliver the keynote address at the 2004 Democratic National Convention, a speech that launched him into the national spotlight and began the rapid ascent that could land him in the White House. Obama writes that "the process by which I was selected as the keynote speaker remains something of a mystery to me." Though he had gotten word that Kerry wanted him to speak, Obama recalls he didn't know what type of billing he'd get. Then, one afternoon, as Signator was driving him from Springfield, where Obama worked as a state senator, to Chicago, where he had an evening campaign event, Obama got a call from Kerry's campaign manager, who asked him to keynote the convention. After he hung up, Obama turned to Signator and said "I guess this is pretty big," according to "Audacity." It reports that Signator nodded and said "You could say that." Signator remained a part of Obama's orbit after he cruised to victory in 2004 and entered the Senate. Though he never technically worked for Obama's Senate office, Signator accompanied the freshman U.S. senator on a tour of a controversial nuclear power plant in northeastern Illinois one week after Obama took office. After the tour, Obama "attended political events for the rest of the day," LaBolt explained. "Mike was present at the tour so that when it ended, he could drive and accompany the senator to those events." There may be a reason other than security that the campaign doesn't want Signator talking to the press. During Obama's 2004 Senate race, in the weeks after Obama's convention speech had marked him as a rising star, Signator accompanied Obama to an African-American parade in Chicago. 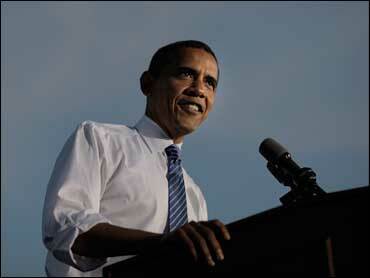 According to an Obama biography by Chicago Tribune veteran David Mendell, the crowd chanted "O-ba-ma! O-ba-ma! O-ba-ma!" and gave the young candidate such a passionate reception that Signator, identified by Mendell as Obama's "driver and bodyguard," joked that he "thought Barack was going to rise up over the people and start saying, 'My children, my children, I have come to free you.'" The comment - among the only quotes of Signator on record - has become fodder for conservatives mocking Obama as a wannabe messianic figure. Whatever the two men's current relationship, the Illinois senator has spent so much time at the Regents Park, many of the residents have their own Obama stories, according to Min Kim. "I've run into him by the elevator," the 21-year-old University of Chicago student boasted last Sunday morning as he waited for a ride outside the building, near Secret Service agents and local cops standing sentry while Obama was inside. Kim admitted, though, that he froze up and didn't say anything to the would-be president. Sometimes, according to pool reports, Obama has dropped by multiple times in a single day, particularly while he was weighing his choice of a running mate. That led some in his traveling press corps to speculate that Obama may have been meeting with prospective vice presidential nominees at Sig's place, and it prompted The Washington Post to crack that Signator was "not, as far as we know, on the short list."